How Do You Fix Microsoft Access Error 2950 'Macro not Working'? Microsoft Access database is a Microsoft’s developed Database Management System i.e DBMS. MS Access also combines the capabilities of Jet Database Engine with a graphical user interface; makes it efficient and easy to use application development platform. Its ease of usage and high inbuilt security features make this DBMS a highly used database system over worldwide. "Macro Not Working: Microsoft Access Error 2950 Fixed"
However, like all database even the most secure one’s are prone to corruption & errors, Microsoft Access database is also no exception to issues. Usually, most of the MS Access errors and corruption occurs due to errors in Macros. Macro is an automation tool in MS Access, used to automate tasks and add functionalities to reports, forms, queries, views, controls, etc. Each macro consists of individual macro actions. In which every actions require one or more then one arguments. Below we will be discussing what causes 2950 Error and how to fix Microsoft Access Error 2950. On running macro a VBA function is called and when a macro fails to call function then user finds an error code with a message i.e: Action Failed Error Number: 2950. Generally Microsoft Access Error 2950 occurs if database is not a trusted by MS Access. Due to Failure of Microsoft Windows Operating System. Missing of some important systems files may cause MS Access Error 2950. Occurrence of system file error due to incomplete file, incomplete installation setup or bad functioning of hardware/software causes Access Database 2950 Error. Microsoft Access macro not working error 2950 also occur by sudden shut down of system or when PC is infected by virus/malware/spyware. The location MS Access file stored might not be a secure location. Any of above activities may lead to corruption or deletion of system data files which offers absent or incorrect database files. Now, whenever a macro is called user faces MS Access Database 2950 Error. On the Message Bar, click on Options. Microsoft Office Security Options dialog box prompt, In this click on "Enable this content" & click "OK". GOTO Microsoft Office Button, and then click on "Access Options". Select Trust Center, and under Microsoft Office Access Trust Center, click on "Trust Center Settings". Note the paths of the trusted locations that are listed. Add a new trusted location. Click on Add new location to do this. Then Move the Access database to the trusted location that you want. Start MS Access tool and Click on "Compact and Repair". When the dialog box opens, double-click on the database that you want to recover, follow the instructions to start the recovery. IF the error resolved Screen will be prompt to save MS Access file with New name. In most of the cases, the process works well. However, if this process doesn’t work and you are unable to recover your database, use a reliable commercial ware to fix this MS Access 2950 database error. 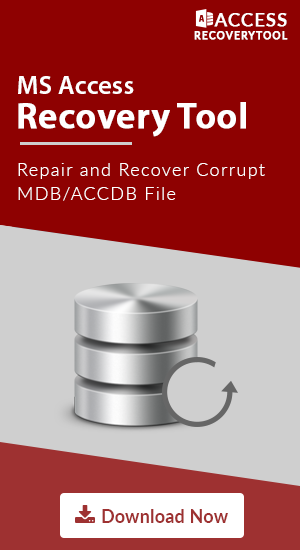 MDB Recovery Tool is programmed to perform quick recovery of corrupt MS Access database. The tool is capable of recovering data from MDB/ACCDB files from inaccessible Microsoft Access database. To evaluate the functionalities of the software, you can simply download its free demo version. It allows you to recover complete data in a tree-like structure. However, You can only preview the recovered data, it doesn’t have option to save. To export/save, go with the licensed version of the software. Macro Not Working: Microsoft Access Error 2950 is discussed above in detail to get it fix easily. Some case may occur where manual solution unable to repair MS Access database where user needs a relaible solution. So, going to any repairing firm or calling Microsoft Experts and spending lot of money try above solution.